O.J. Simpson was thrown out of the Cosmopolitan Hotel in Las Vegas last year. LAS VEGAS -- O.J. 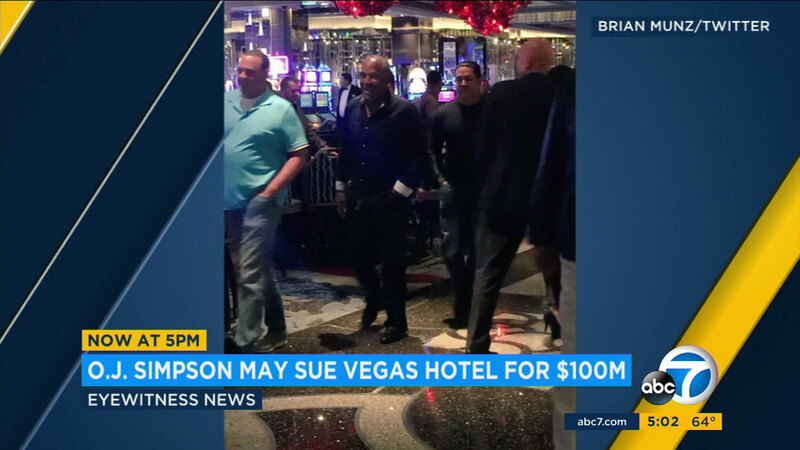 Simpson is threatening a $100 million legal action against the Cosmopolitan Hotel in Las Vegas, over an incident in which he was thrown off of the property last year. Simpson's attorney is claiming the hotel acted "with malice and racial prejudice" when it kicked him out and publicly said it was because he was being drunk and disruptive. The hotel issued a trespass notice to Simpson after he was there dining with friends Nov. 8. Some media reports attributed to unidentified hotel staff described Simpson as drunk and disruptive that night and that he became angry at hotel staff and broke some glasses. "The Cosmopolitan Casino discriminately singled out Mr. Simpson amongst his non-African American friends and subsequently expelled him for what turned out to be a fake reason while he peacefully visited the Cosmopolitan property on or about the evening of November 8, 2017," attorney Malcom LaVergne wrote to the hotel. LaVergne also claimed that hotel surveillance video later reviewed by police officers "proved that the Casino staff and/or affiliates made up a false narrative." Simpson remains on parole after serving 9 years in a Nevada prison for armed robbery. His parole conditions allow him to consume alcohol, but not in excess. One witness told ABC News at the time of the incident that others in Simpson's party drank wine, but that Simpson himself abstained. At the time, his attorney said he underwent drug and alcohol tests the next day, which came back negative.